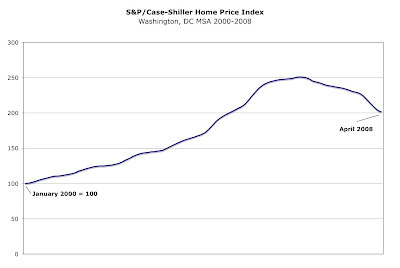 The April 2008 S&P/Case-Shiller report was released today. 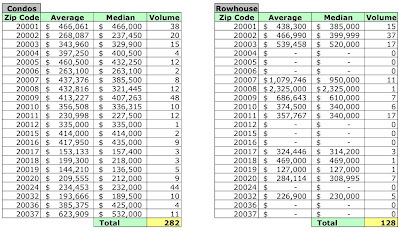 Data through April 2008, released today by Standard & Poor’s for its S&P/Case-Shiller Home Price Indices, the leading measure of U.S. home prices, show annual declines in the prices of existing single family homes across the United States continued to worsen in April 2008, with all 20 MSAs now posting annual declines, 13 of which are posting record low annual declines, and 10 of which are in double-digits. 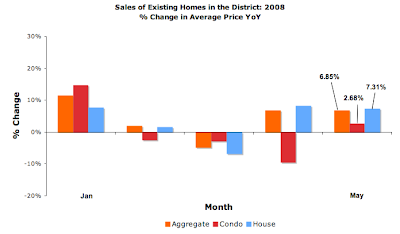 For the Washington, DC area, the market's not getting better [see the chart I created using their data below]. For March 2008 to April 2008, a 1.05% decline. 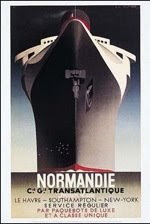 For April 2007 to April 2008, the market's declined 14.8%. I'm well aware the S&P/Case-Shiller report for DC covers a very broad area and excludes condos, which are a significant part of the District's market. 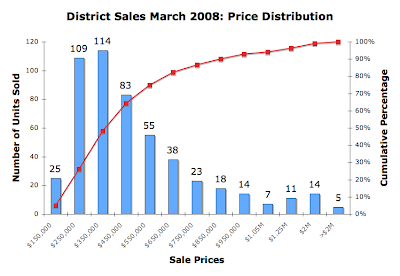 However, it is an important data point when considering the health of the housing market in the District. 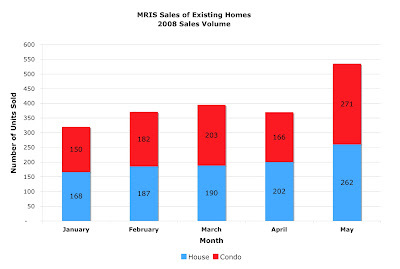 MRIS has released its data for signed sales contracts for existing home sales in May 2008. 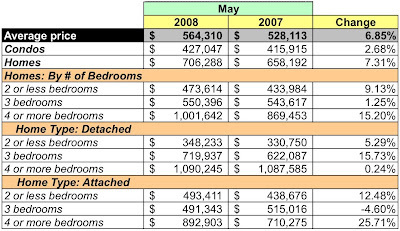 Compared to May 2007, fewer units sold, lower dollar volume, but higher average prices for condos and single family homes. The condo market is still challenged. High end homes are propping up average prices; as I noted in yesterday's post, approximately 10% of units sold were valued at more than $1MM. Units sold: 533, down 22..87%. Average sales price: $ 564,310, up 6.85%. Median sales price: $ 440,000, up 5.01%. I'm really having a problem with the average prices MRIS is reporting. I'm trying to reconcile how prices can be going UP while dollar and sales volume is DOWN significantly YoY. 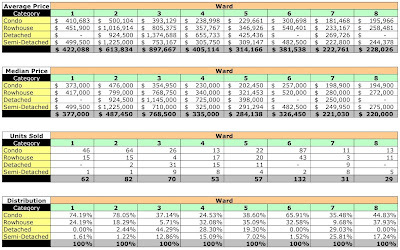 The fact that the data are not granular makes it difficult to determine the impact higher end homes - those costing more than $1MM - have on skewing the pricing data. Almost 10% of units  sold for more than $1MM and, of those, 7 went under contract for more than $2.5MM. Except for 2 bedroom detached homes, every housing category reported by MRIS had at least two units go under contract for more than $1MM. 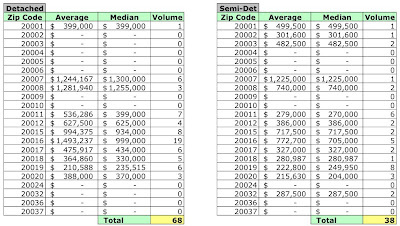 Assuming 45 sold for $1MM and 7 sold for $2.5MM, then those 52 homes/condos represent 20.78% of May's dollar volume. Subtracting them from the dollar and unit sales volume leaves us 481 homes/condos selling at an average price of $495,379, 12.21% less than reported by MRIS. Ultimately, I'm beginning to place less value on MRIS' reported average and median price and putting more weight on total dollar volume and unit sales volume to get a sense of the market's pulse. A huge increase in units going under contract in May compared to April - increases MoM of 63.25% for condos and 29.7% for homes. However, for almost every category of housing reported by MRIS, unit sales and dollar volume has fallen dramatically YoY. 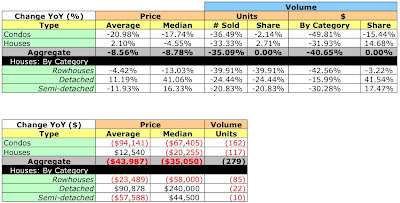 Condos are down 25% on dollar volume and 27% on unit volume. Homes down 12.14% on dollar volume and 18.13% on unit volume. 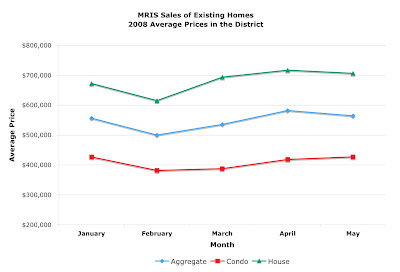 [Updated 6/14] In aggregate, the average price in the District has risen 1.4% in 2008 [May compared to January]. Average prices for condos are essentially flat for the year [+0.07%] while those for homes have risen 5.05%, compared to January 2008. [Update 6/14] Based on May's sales volume, there's now 6.24 months of inventory for condos and 7.25 months for homes, decreases of 39.67% and 22.94% from April 2008. 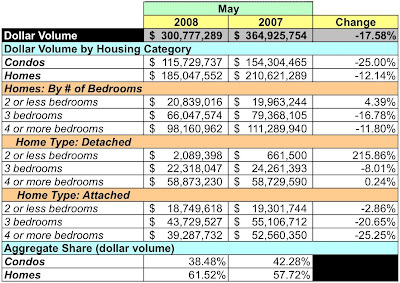 But, compared to May 2007, the number of condos listed has risen 4.8% and for homes, 22.7%. Given the huge increase in unit sales MoM despite the lower unit sales and dollar volume YoY, I'm coming to the conclusion that most units are selling for lower prices. Unfortunately, MRIS' data makes it difficult to categorically prove it. I'd appreciate insights others might offer to resolve this conundrum. 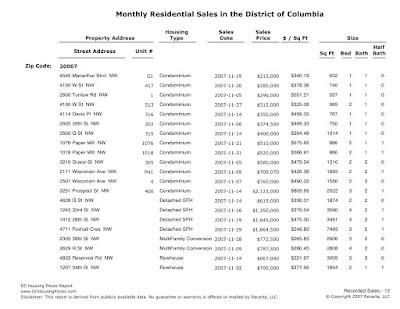 MRIS released data on May's sales of existing homes and condos in the District this morning. I won't get a chance to do a full analysis until tonight, but it looks like the market is still challenged. Almost 10% of homes and condos sold - 52 - sold for more than $1MM and 7 of those sold for more than $2.5MM. At a glance, it looks like the number of condos sold fell 27%, but their average price rose 2.68%. Update [June 12]: Our A/C died Monday night. We've gone from simply replacing the [34 year old] furnace to that, the indoor coils, and the outside condenser. The net effect is we've spent our evenings at the local Days Inn while awaiting the installation of the new equipment so I've been unable to get to the MRIS data as promised. If all goes well, I should be able to get to it tonight.